ONLY 43,638 Miles! Heated Leather Seats, Moonroof, Satellite Radio, iPod/MP3 Input, Bluetooth, Panoramic Roof, Aluminum Wheels CLICK NOW! Leather Seats, Sunroof, Panoramic Roof, All Wheel Drive, Turbocharged, Satellite Radio, iPod/MP3 Input, Bluetooth, CD Player, Aluminum Wheels, Dual Zone A/C, Heated Leather Seats. MP3 Player, Steering Wheel Controls, Child Safety Locks, Electronic Stability Control, Brake Assist. PREMIUM PLUS PACKAGE Heated Windshield Washer Nozzles, Heated Side Mirrors, 3-Step Heated Front Seats, Aluminum Interior Package, alu-optic air vent surround, glovebox handle, window switches and mirror switch trim, door handle surround and parking lever trim in alu-optic, Aluminum Mistral Decorative Inlays, High-Gloss Aluminum Window Surrounds, Audi Advanced Key, keyless start, stop and entry (sensor in front doors), 12-Way Power Passenger Seat w/4-Way Power Lumbar. Audi 2.0T Premium Plus with Monsoon Gray metallic exterior and Black interior features a 4 Cylinder Engine with 220 HP at 4500 RPM*. 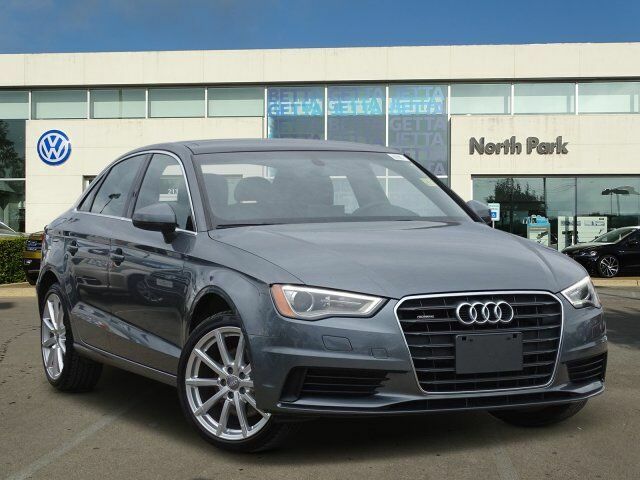 "Compared with other small luxury vehicles, the 2015 Audi A3 feels more grown-up: an honest-to-goodness luxury car instead of a fancy compact." -Edmunds.com. Great Gas Mileage: 33 MPG Hwy.